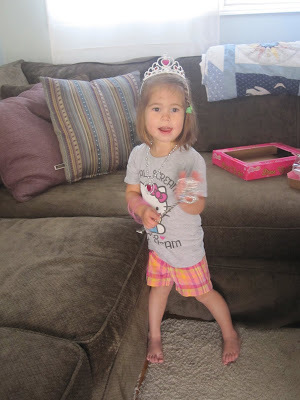 We had a great time celebrating Samantha's 3rd birthday last week. Her actual birthday was on Thursday the 7th. Chris went into work a little late so we could have a special birthday breakfast together and watch Samantha open some presents. She even got to have a birthday cupcake with her breakfast! 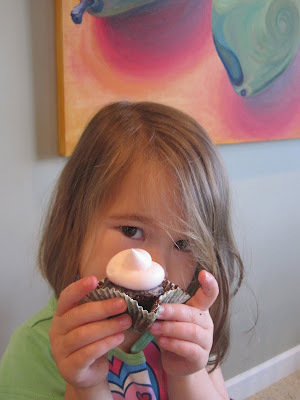 She licked off all the frosting and them asked for more...how could I say no on her birthday, so she got a double dose of frosting! 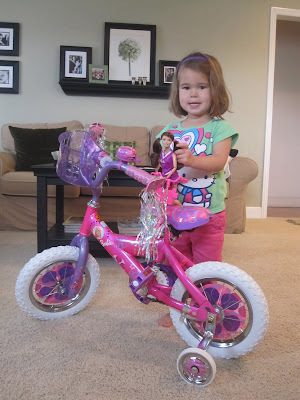 She got her first big girl bicycle from CC and Grandpa. A Barbie two-wheeler. It even came with a Barbie sized bike for her new cheerleader Barbie! Thanks CC and Grandpa! 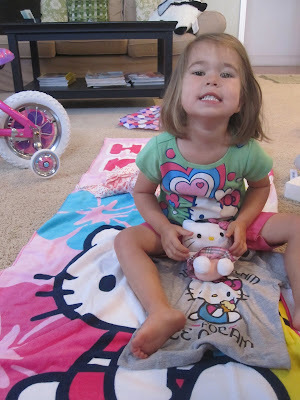 She got quite a bit of Hello Kitty stuff from us and even more from Omi and Gung Gung, including Hello Kitty ballet slippers for her ballet class. We had her party on Saturday. 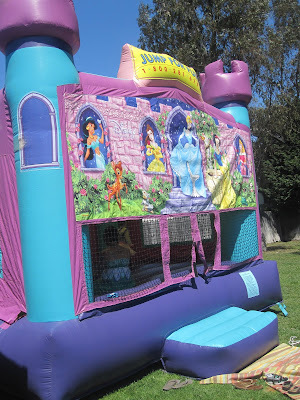 Her only request was a princess jumpy house. So that's what she got! We invited over our family and friends. I made cupcakes and cake pops and we had a fun afternoon. She's already asking when she her next party is going to be! 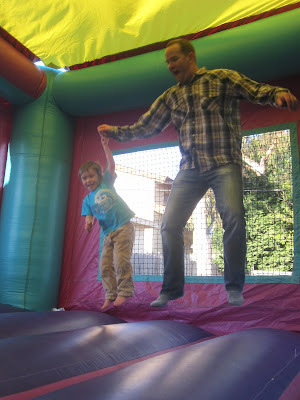 Luckily Nicholas' birthday is at the end of the month, so she won't have to wait too long for another jumpy house. This week is spring break, so we took advantage of the beautiful day and headed to Tanaka Farms, an organic farm in Irvine, with a few other families. We got a tour of the farm in a tractor pulled wagon. All along the way they gave us samples of their produce - cilantro, green onions, spinach, lettuce, sugar snap peas, carrots. We were told to throw whatever part we didn't want over our shoulders onto the dirt road. Samantha didn't eat much, but kept asking for samples so she could throw them out the wagon! 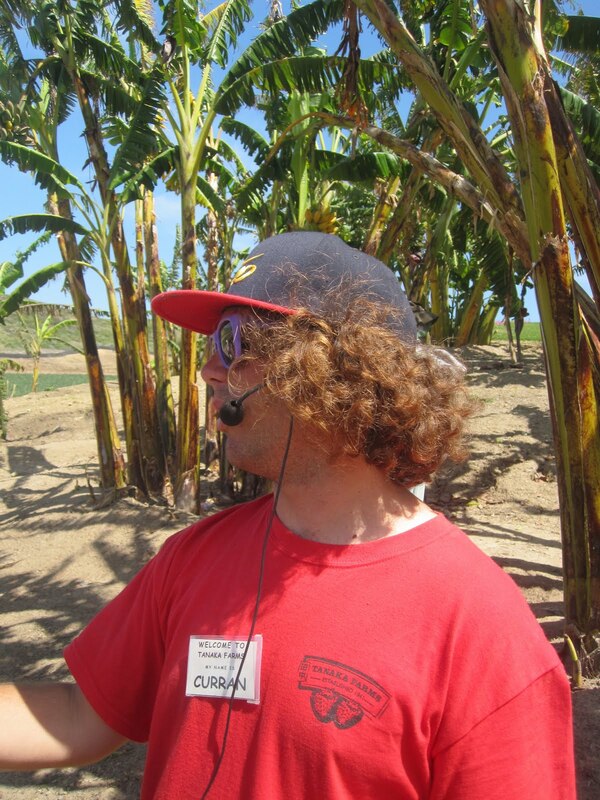 Our tour guide was this energetic guy who was a cross between Carrot-Top and Napoleon Dynamite. 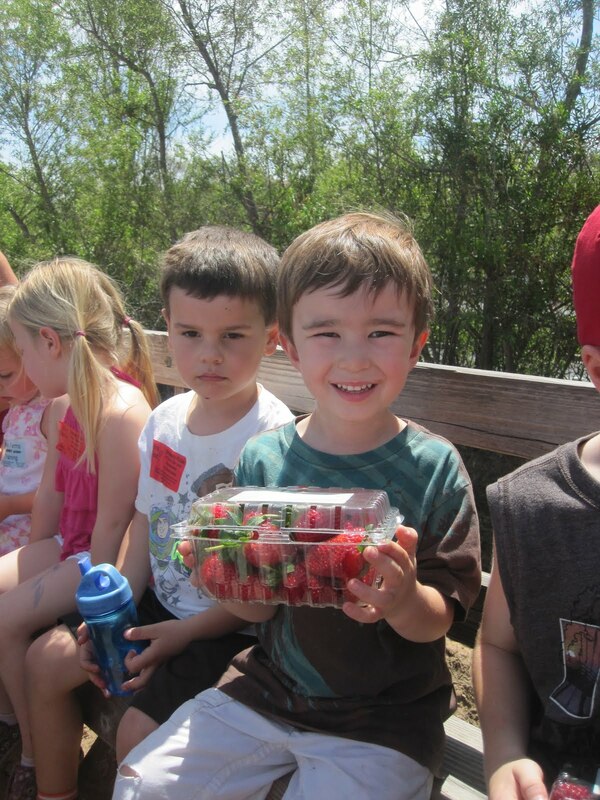 The last stop of the tour was the strawberry fields where we got to pick and taste strawberries. Samantha wasn't cooperating with the picture taking, but she really was having fun. Nicholas was very proud of his harvest and we are excited to have fresh strawberries with vanilla ice cream for dessert tonight. Mmmm! We've had quite a bit of rain around here lately, enough for California to officially declare that we are no longer in a drought. We have another storm due to arrive later this week just in time for Samantha's birthday party...sad, but in between these cold and wet storms we've also had some beautiful days. One day last week hit 85 degrees! 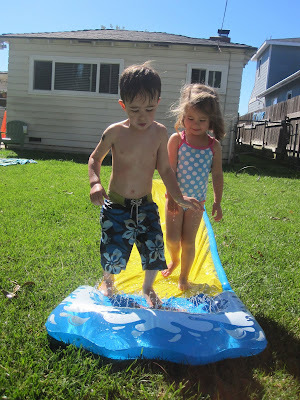 We busted out the Slip 'n Slide and had some fun in the sun. As promised in my last post, here is a picture of Samantha's at her first ballet lesson. Parents sit outside and look in through a glass window, so I wasn't able to get any pictures during the instruction time. Supposedly they will put on a little recital at the end of the session for the parents to sit in and watch. Samantha is the youngest in the class since it is for 3-5 year olds and she just made the age requirement since she's turning 3 this week. 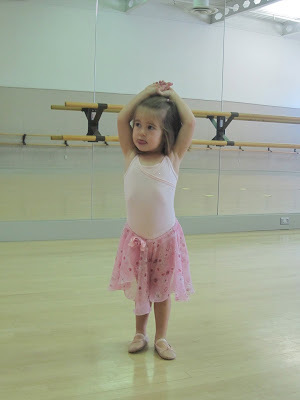 She liked the class, but for the first 10 minutes she was sitting on the floor watching everyone dancing around her. I don't think she understood that she was supposed to participate! 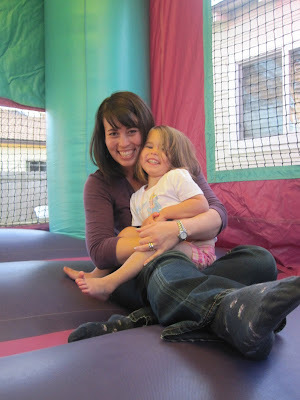 Finally the teacher got her up and Samantha started following along a little bit. Maybe this week's class will be a little more successful! I haven't been doing much with my flower business lately, but last week I did centerpieces for my school's annual fundraiser dinner and auction. 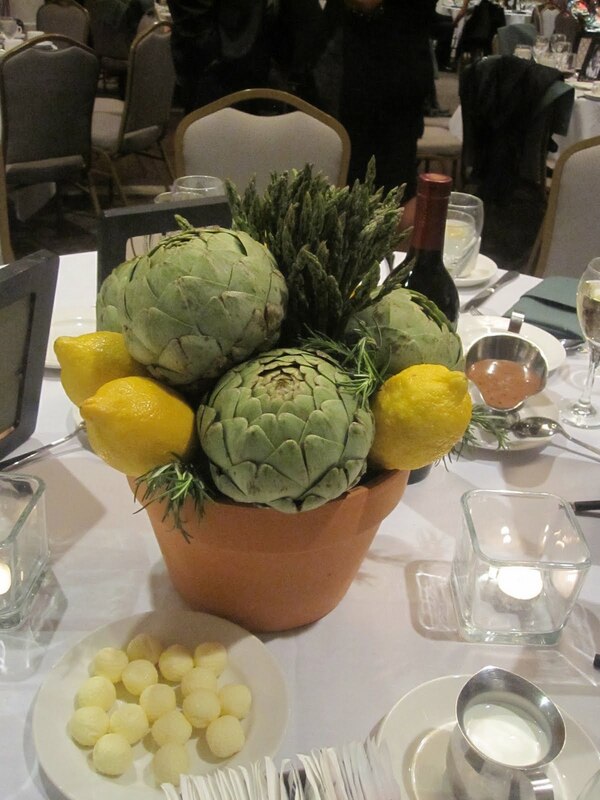 The theme was "Going Green", so they asked me to use vegetables to make the centerpieces reusable. I used artichokes, asparagus, lemons and rosemary. They turned out pretty well and they sure tasted good too!